Any plumbers or people who know plumbing? My question is relating to hot water. I moved into a flat a few months ago and have never been able to get hot water out of any taps. The shower gives me hot water but nothing else. No water seems to come out of any of the hot water taps.Is their something I can do or do I need a plumber? Assuming your shower is mains water fed via the boiler and not electric then the hot taps should also be plumbed in from the boiler. If not it might be that there is an electric immersion heater somewhere specifically for heating tap water. Is there a switch somewhere which you don't know what it turns on? You've put up with no hot water for months!! Are you sure a gate valve has not been closed in the airing cupboard. I'm going on the possibility that the shower has it's own heating element and maybe the hot water is heated in an immersion tank (big copper cylinder possibly foam lagged) that has either a timer fitted or an on/off switch. It's possible that the timer is not set or the switch has never been turned on - turning it on and you should hear the elements start to "bubble/hiss" after a few seconds. Or the other possibility if the timer or on switch has been switched to on that the element may have blown. Possible to replace @ about £15 but unless you have experience you need to read/research as there are a few pitfalls if not done right. OK first. You say there is not hot water coming out the tap. Are you talking about any water coming out at all or is the water just not hot. If there's no water coming out the most likely a valve has been closed. Look where the hot water take is located and check the valves or taps are open it maybe a red colour or look like a garden tap. It may be a little stiff so the use of a little force is sometimes required. 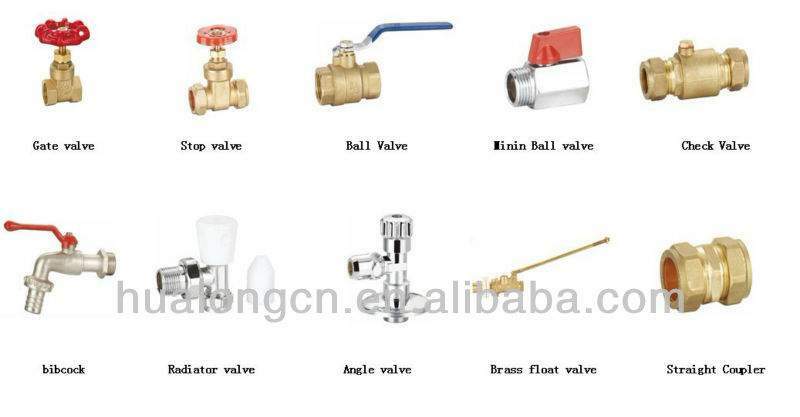 Look up gate valve images on Google so u know what u are looking for. sounds like your immersion heater is not working. the shower is probably electric and so heats the water itself. I assume you don't have a boiler. Call your landlord. It's their responsibility!! Thanks guys for all your help, I'm gonna answer some of the questions poised so far. I do have a boiler but its one of those old one wrapped in foam. The heading that I have is electric as I'm on economy 7. I have never been able to get any water out of the hot water tap. Finally I've been able to get hot water but only through the shower which is electric. Thanks guys for all your help, I'm gonna answer some of the questions … Thanks guys for all your help, I'm gonna answer some of the questions poised so far. I do have a boiler but its one of those old one wrapped in foam. The heading that I have is electric as I'm on economy 7. I have never been able to get any water out of the hot water tap. Finally I've been able to get hot water but only through the shower which is electric. Does the tank itself get hot? Sounds like you have a manual electric immersion water tank should be a switch in the cupboard with the tank. Will need to turn it on hour or so a day or before bath etc. boiler but its one of those old one wrapped in foam. 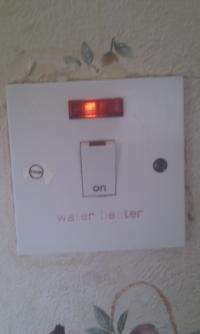 There should be either a timer control or an immersion switch (see image) to give power to the immersion heater. If there is no red light or other after turning to on position it is possible that the main fuse has blown (or tripped depending on circuit board/fuse box). If she is on economy 7, could some bright spark have set the timer so it only switches on in the night (the previous owner could have worked nights for instance) ? If you are not getting any water it is simply the valve is closed not letting water into the tank. Don't take notice of timers or immersion heaters as these are simply controls used to heat the cold water to make it warm. As in the pictures above u need to look for the valve with the red handle or the other garden looking tap which fills the tank to see if there open. Also check the ball valve to see if its not stuck in the off position as this happens if it has not moved in along time. If you are not getting any water it is simply the valve is closed not … If you are not getting any water it is simply the valve is closed not letting water into the tank. Don't take notice of timers or immersion heaters as these are simply controls used to heat the cold water to make it warm. As in the pictures above u need to look for the valve with the red handle or the other garden looking tap which fills the tank to see if there open. Also check the ball valve to see if its not stuck in the off position as this happens if it has not moved in along time. I read it as the problem is not getting water, it's just cold coming out of the hot tap. Ohh.. Reading the question again.... OP is there ANY water coming out of the hot tap?? I read it as the problem is not getting water, it's just cold coming out … I read it as the problem is not getting water, it's just cold coming out of the hot tap. Ohh.. Reading the question again.... OP is there ANY water coming out of the hot tap?? Nope no water is coming out of the hot water taps. Check the cylinder - tap with something metal - if hollow sound its empty - then if empty you need to check the feeder tank (as these type of systems are gravity fed). If the feeder tank or cylinder is empty you'd need to question why? possible it has leaks somewhere and therefore been drained/disconnected. I would suggest that you get a qualified plumber to investigate but get a few quotes and check for reviews. If no water at all from hot taps then trace the pipes back from taps and tank to see if there's an isolatation valve, similar to those for the washing machine but may not have red /blue handle just a screw driver slot or a small "wheel"
that's is not an old boiler. 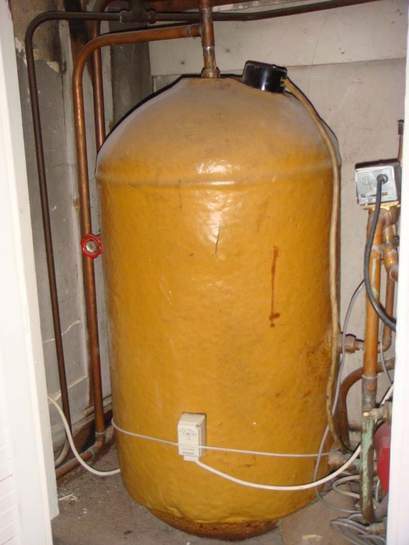 it is the immersion heater as I said in my earlier post. it is independent of the electric shower, it heats the hot water for the flat. you will need to speak to your landlord who will be able to tell you how to switch it on or get it repaired if broken.